A staple since going solo in 2001, Alasdair Roberts nevertheless remains a relative underdog of Scotland's extensive folk scene. In a sense, you could even say his career to date has been that of a classic nearly-man, having attracted all but perennial acclaim yet little in the way of widespread recognition - aside from his home nation, where he's quite rightly a hugely respected cult figure. The fact the man from Callander has always been so defiantly unhip has, of course, played a considerable role in this pattern. Indeed when he's not reworking old folk numbers as on excellent records such as No Earthly Man and Too Long In This Condition, he's seemingly crafting his own future standards; a process once more exemplified on latest LP A Wonder Working Stone. His first collection of originals in four years, it's a set which ticks practically every box one would associate with Roberts' music, being as it is both steeped in tradition and a pouring with passion - the 'friends' referenced on its cover as ever providing more than capable backing. It's not about to herald a belated breakthrough, though given he's so entrenched in his own fruitful niche you sense that was never really an objective. 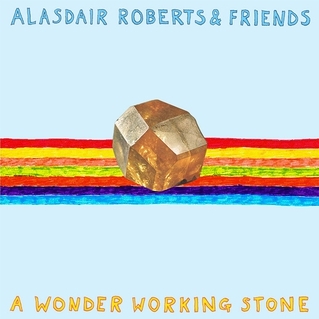 Alasdair Roberts & Friends' A Wonder Working Stone is out now.